Recognize excellence with a plaque from Awards Zone! With our many options in Award plaques we can meet your specific recognition plaque and award plaque needs. 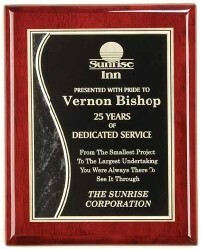 We have award plaque options in marble, acrylic, wood, and glass. Our specially trained recognition specialists can personalize your plaque in numerous ways, to achieve the look you envision for your award, including laser engraving and sublimation. With our selection of plaques, we are sure to be able to satisfy your style and budget. All plaques can be customized with your business logo or clip art of your choice. Call or email us today to receive information on your ideal plaque. Say what you mean forever with a Plaque, Crystal, or Acrylic Award from Awards Zone the Award Plaque Leader.